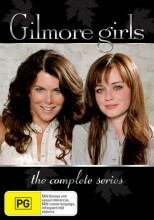 The Gilmore Girls DVD Box Set includes all 7 seasons and 153 episodes of this class family drama show. Welcome to picture perfect Stars Hollow, Connecticut. Population 9,973. And home of thirty something Lorelai and her teenage daughter Rory the Gilmore Girls. Lauren Graham plays quick witted Lorelai, mother of Rory (Alexis Bledel) and also her daughter's best friend, confidante and mentor determined to help her avoid the mistakes that sidetracked Lorelai when she was a teen. Hearts break and mend, careers end and begin, folks stumble and pick themselves up. All the Love, all the laughter, all the witty banter here in one Complete Set featuring all 7 seasons, 153 episodes. The most heart. The most humour. The Most Gilmore Girls. All 7 seasons in one must-have collection. Welcome to picture-perfect Stars Hallow Connecticut. Founded 1779. Population 9973. And home of thirtysomething Lorelai and her teenage daughter Rory - the Gilmore Girls. Lauren Graham plays quick-witted Lorelai manager of the historic Independence Inn mother of Rory (Alexis Bledel) and also her daughter's best friend confidante and mentor determined to help her avoid the mistakes that sidetracked Lorelai when she was a teen. A gifted ensemble plays the colourful Stars Hollow townies and Gilmore family relations. Hearts break and mend careers end and begin folks stumble and pick themselves up in a series that's "blissfully brilliant" (Ken Parish Perkins Fort Worth Star-Telegram). All 153 Episodes on 42 discs with Fabulous Extras including Unaired Scenes Behind-the-Scenes Episode Commentaries and much more! Bonus Complete Episode Guide and Your complete Guide to Gilmore-isms also included. Click the button below to add the GILMORE GIRLS - THE COMPLETE SERIES to your wish list.